UPDATED: January 27, 2017, with details on slow cooker & INSTAPOT methods. This recipe has been tried and tested and it works so well that it deserves yet another go around. The true secret is to saute your vegetables to bring out the most flavor and to soak the beans, soak them overnight. Laissez les bon temps rouler! In honor of Mardi Gras, Shrove Tuesday or Fat Tuesday - I made a pot of vegetarian red beans and rice. This dish is definitely in the category of one pot meals made in the style of the Big Easy's cheap-n-easy. It includes a mess of the Cajun Holy Trinity with a smattering of carrots, a whole lotta Tabasco or Hot Sauce of Choice, a chipotle pepper and some nice old red kidney beans. Let it cook down in and after a few hours you got yourself a big ole pot of spicy goodness. As much as I like my meats, sausages and other porky treats - this loose interpretation of red beans and rice was made out of necessity so I could have a vegetarian meal option to take to my kosher workplace. If you use enough vegetables, a good chipotle pepper and let the beans cook long enough, you will not miss the meat. Besides, you could have something on the side if you need or crave that extra protein. The main thing is letting the beans cook down long enough that the begin to fall apart. If the beans you have are old and they just never get to that mushy stage, feel free to smash them a bit with the back of a spoon or an old fashioned potato masher. The main thing is that the beans just cook and cook and cook and make their own "bean gravy", absorbing all the spice and smokey heat of the chipotle pepper. Season with salt AFTER the beans are cooked down not before. Remember to taste before you season, as the dish cooks, cools and sits, its flavors will develop even further. I made this dish on Saturday and ate it on Sunday. It was when I reheated it that I seasoned it with salt and additional Tabasco Sauce. As for using okra - I know I'm mixing my meals here, making my red beans and rice morph into some sort of mumbo gumbo. I like okra and I wanted something else in the dish. Skip it if you don't like, don't have or can't find okra. By the way, frozen okra is far easier to find in most grocery stores and works great. You can also stir in frozen collard greens towards the end of the cooking time too. For the Instpot Method, I found that upon the 2017 cooking, in my instapot, adding in the frozen okra and collard greens after it cooked for 15 minutes and the pressure came down, I only had to cook it for another 5 minutes for the okra and greens to cook into the mixture. I would say the total cooking time was around 1 hour 15 minutes - allowing for the sauteing, pressure to build up and come down and some rest time. Pick over the red beans and discard any pebbles, stones or beans that are split or misshapen. If time permits, soak the beans in cold water for two hours or overnight. Drain and rinse the beans and set aside. In a large stock pot or heavy bottomed pot, such as a Dutch Oven, heat the vegetable oil over medium high heat until the oil begins to shimmer. Add in the onions, celery, bell peppers and carrots; sweat the vegetables for 10 minutes, or until the vegetables begin to take on a bit of color (but don't let them burn or caramelize). Next, add in the minced garlic and saute for 2 minutes. Add in the soaked red beans, the bay leaves and the chipotle pepper. Pour in 4 cups of cold water, or enough water and the bottle of beer to cover the beans and vegetables by 1 to 2 inches. Bring the mixture to a boil and then reduce heat down to lowest setting. Keep the pot at a gentle low simmer for as long as it takes for the beans to cook down and become tender - so tender they begin to fall apart. This may take 2 to 3 hours. Keep an eye on the pot, adding more water as needed. As the beans cook down, the mixture in the pot will go from recognizable pieces of vegetables in a watery broth to looking like a pot of dark brown mush. When this happens, taste the beans, seasoning with the black pepper, hot sauce and salt. Add in the okra and collard greens (if using it) about 15-30 minutes before the mixture is finished (towards the end of the cooking time, when the mixture is all cooked down. Cool the mixture and refrigerate. At serving, season to taste with salt, pepper and hot sauce. Serve hot over rice. Makes 6-8 servings. Recipe can easily be doubled to serve a larger crowd. 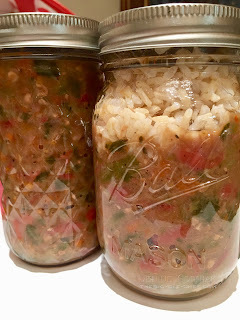 Red Beans and Rice, in a Jar! okra, and collard greens. One of my best batches yet! Saute all the aromatics in the pot set to saute, for 30 minutes. Mostly because I was doing other things. Saute long to really develop the vegetables flavors, and again, to cook them down. I had filled the pot with onions, celery, peppers, carrots, and garlic, and when I was done the saute, it had cooked down by more than half of the volume, plus all the liquid they gave off evaporated! Next added in the beans, beer, water, bayleaf, seasonings, etc. Set the time to bean mode, cooked for 15 minutes. Let the pressure come down naturally, for 15 minutes, then carefully released the steam; open lid, add in frozen okra (and this time I also added in a generous handful of frozen collard greens for more veggie oomph!. Reseal, and set the time on manual for 5 minutes to cook further. Let pressure come down again, 10-15 minutes, then open the pot. Stir, mash the beans if needed, slighlty. Season to taste with salt and hot sauce. Remove chipotle pepper and bay leaves. Serve over rice. Or chill in a shallow pan before refrigerating. The red beans will taste better the next day once they had a chance to sit and allow the flavors to marry. Total cooking time was about 1 hour and 15 minutes! Tasted like my 10 hour method, if not better! Slow Cooker Method - I like to saute the aromatics for 15 minutes or so, to develop their flavors, and to cook them down enough to all the ingredients fit into the slow cooker. Then I add everything to the crock pot, put the lid on and set it for 8 hours! Follow the above directions except for that! After the ingredients have cooked for at least 4 hours. and cooked the mixture for another hour or so. This batch cooked for over 10 hours on low! The batch after I took a potato masher to it to "puree" the mix down! This is what the mixture looks like as it cooks - you can distinguish all the vegetables and beans - it looks more like a vegetable bean soup. Have patience! It takes a long time to cook down but it's worth the wait!